Trued: Sometimes a tire is simply cut to be "trued". That is, simply making sure that it is perfectly round on the tire contact patch and tread surface. Although mounting is the most critical step in getting a tire to be "round", to be certain a tire is 100% concentric, often times it is cut to true it. Cut Tires: A cut tire is not what most people outside of karting would think. It's not something bad or detrimental to the tire at all. In fact, it is most often a good thing. Karting tires, especially in oval track racing are "cut" in a tire lathe. That is, a lathe built specifically to rotate a karting wheel and tire so that rubber may be cut or trimmed from it's surface. 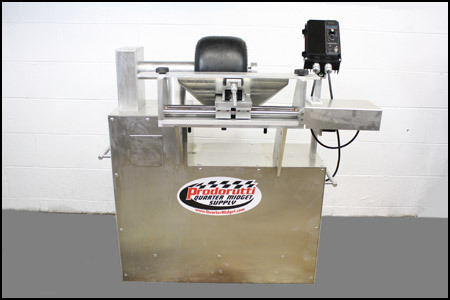 Cutting a tire in a tire lathe will true the tire and cut a particular profile into the contact patch for reduced or induced grip and sidebite, whichever is needed by the racer. We offer Go Kart & Quarter Midget Tire Truing and Cutting for Vega R/R, Hoosier R/R, & Dunlop L/R There will be other brands and sizes available very soon. Contact us for details. Price per tire $15.00 ea. Refinish: A refinished tire may be ground or sanded....You typically do this on tires that have not been used in some time, or have been sealed over. Refinishing removes a thin layer of rubber from the tread surface of the tire to reveal a "fresh" layer, rather than a cured or "dead" layer that may have dried out over time. Refinishing a tire will reduce the tread depth slightly and reduce the wearability as well. Some racers will refinish a tire or simply grind a tire between races just for the "perceived" advantage, although if properly cleaned, this should not be necessary every night. Siping: Siping a tire is slicing the surface rubber of the thread with razor blade cuts. Cross siping builds heat in a tire quicker, while circumference siping generally helps to cool a tire once it is up to operating temperature. Siping should be avoided on very dusty/sandy track surfaces. Some kart tracks do not allow this, check with your track or sanctioning body's rules before siping your tires.